August 4, 2009 Washington, DC: James Landwehr, chair of the Board of Trustees for the National Institute of Statistical Sciences (NISS) announces that Ramanathan Gnanadesikan, retired statistician, is recipient of the 2009 Jerome Sacks Award for Cross-Disciplinary Research. The award was presented to Gnanadesikan at a NISS reception held August 3 at the Joint Statistical Meetings (JSM) in Washington, DC. The award, named in honor of Jerome (Jerry Sacks), the founding director of NISS, was established in 2000 to "recognize sustained, high-quality cross-disciplinary research involving the statistical sciences," that exemplifies the NISS role of identifying, catalyzing and fostering high-impact, cross-disciplinary research involving the statistical sciences. Gnanadesikan is being recognized for pioneering work in multivariate data analysis,as well as helping people to recognize the importance and the central role of data in statistics. He worked with others at Bell Laboratories and Bellcore, (now Telcordia Technologies) on important projects such as speaker recognition, which involved statisticians working hand in hand with acoustic engineers. 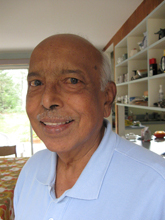 Gnanadesikan was always interested in helping younger people to enter the field of statistics. He helped start a program for junior high school students to spend a summer at Bell Labs. He was also very involved with the New Researchers Committee with the Institute of Mathematical Sciences (IMS). Gnanadesikan was among a small group of statisticians who-along with Sacks, Ingram Olkin and others--pushed for creation of a statistical institute focusing on cross-disciplinary issues, leading directly to the establishment of NISS in 1990. In addition to his time at Bellcore, he was the first president of the International Association Statistical Computing in 1981 and president of IMS in 1989. He has also served on the board of directors for the American Statistical Association and the International Statistical Institute. In 1991, he joined the faculty at Rutgers University. "This award is particularly meaningful to me since I have known Jerry Sacks from his early career days as a faculty member at Columbia University in the late 1950s," comments Gnanadesikan, "I am deeply honored to join the group of outstanding people who have received this award in past years." The National Institute of Statistical Sciences was established in 1990 by the national statistics societies and the Research Triangle universities and organizations, with the mission to identify, catalyze and foster high-impact, cross-disciplinary and cross-sector research involving the statistical sciences. NISS is dedicated to strengthening and serving the national statistics community, most notably by catalyzing community members' participation in applied research driven by challenges facing government and industry. NISS also provides career development opportunities for statisticians and scientists, especially those in the formative stages of their careers. NISS is located in Research Triangle Park, North Carolina. For more information about NISS, go to the new website www.niss.org.